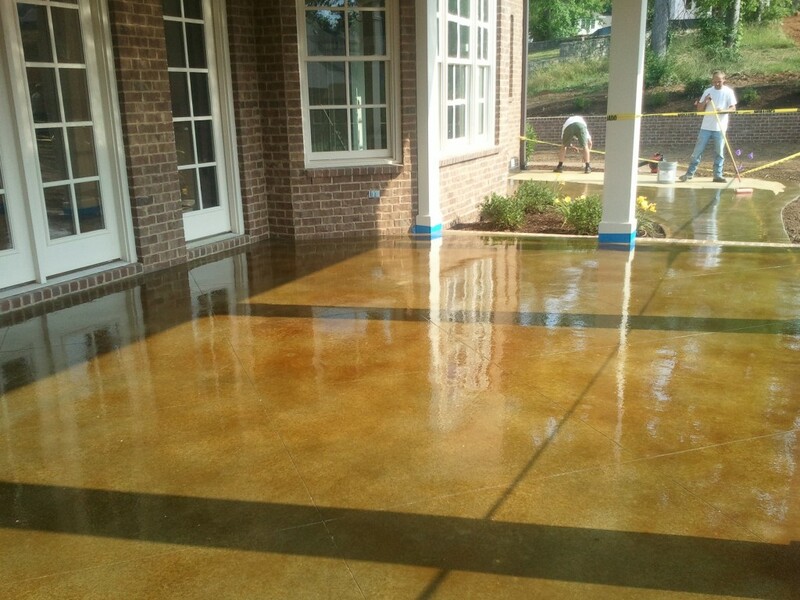 Are you looking for stained concrete in Nashville, Tennessee? People love acid stained concrete because of the modelled or varigated colors it produces. Unlike a solid paint color, acid stained concrete produces light and dark colors in one application. There are many options to choose from today. However not many years ago there were only about eight acid stain colors available (some people refer to it as acid washed concrete). The colors were mostly earth tones. The acid stain colors that we started with about 15 years ago were cola acid stain, vintage umber acid stain, English red acid stain, malay tan acid stain, aqua blue acid stain, black acid stain, and green lawn acid stain. There were no other options until about five years ago. Companies began to make acetone dyes that were uv stable and produced the same varigated look as acid stain. Then all of a sudden the stained concrete industry changed. An acid stain is much more difficult to control. You never know what you will get when you apply an acid stain to concrete. Depending on the chemical makeup of the concrete you could end up with a color that looks nothing like that on the chart. Acetone dyes are more true to color. Secondly after you apply an acid stain you need to let it react with the concrete for about 12 hours to produce the modelled effect. Then you have to neutralize it with water and ammonia and let that dry before you seal the surface. An acetone dye dries so fast that you can spray the floor and walk to the other side of the room and begin putting a clear coat of epoxy down. They are much easier to apply, you get a more dependable color and save about a day in installtion time. Acetone dyes are the preferred staining option for TKO Concrete, Nashville, Tennessee. However we are experienced in both applications and can do either for you.